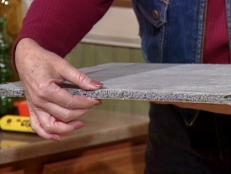 Don't freeze those tootsies: Keep any room warm and comfy with radiant floor heat. Cut all of the panels to size, and lay them out as you want them before gluing any of the panels down. Cut several 12 inch pieces of the PEX pipe, and lay out the panels. Start at the longest wall. 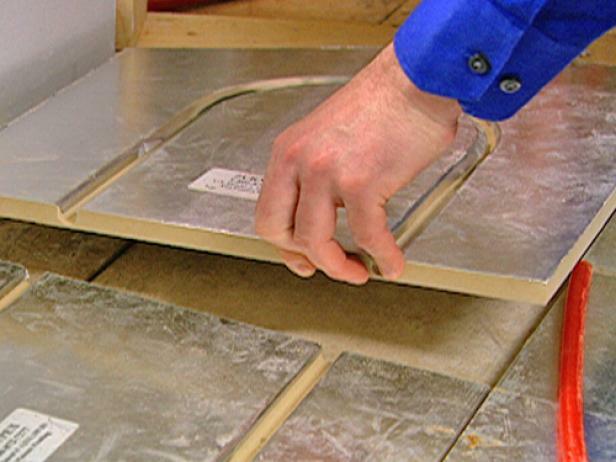 Insert a piece of the PEX into the track to ensure that the panels are aligned. Use a rubber mallet to help secure the PEX into the track. Continue fitting the panels and securing them with the PEX. 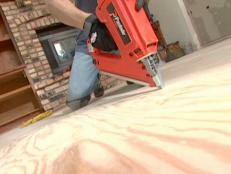 Mark the panels that need to be cut, and use a circular saw to make the cuts. When making a filler piece, make them as big as possible. Continue around the room, fitting the panels into place. 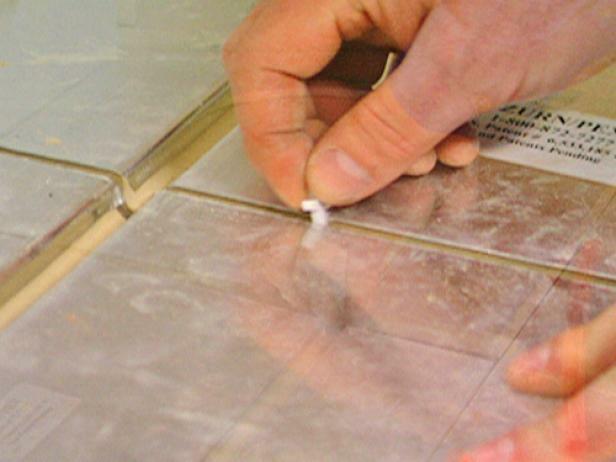 Note: Use tile setters between each panel to create a 1/8 inch gap to allow for expansion. Glue each panel down starting in the corner of the room. 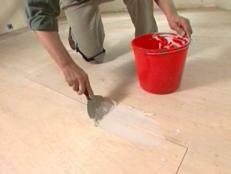 Apply the adhesive to the back of each panel in the center and along all four edges. 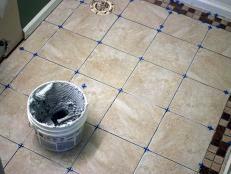 Be sure to apply an even bead of adhesive on the tiles. Place the panel into position, and place a tile spacer in between the panels. Screw the panel into place. 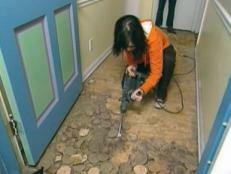 Remove the next panel, and apply the adhesive. 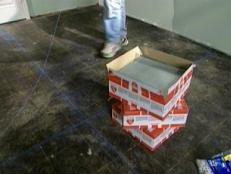 Insert the spacers and reinsert the short piece of PEX into the track to further ensure alignment. When the tile is positioned, screw it down. Use at least 10 screws on a full panel. 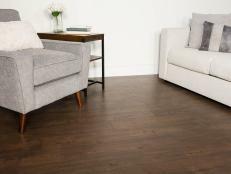 The thermostat that powers radiant heat flooring has a sensor that measures the temperature of the floor. The placement of this sensor is crucial for optimal performance. The best place for the sensor is midway in the radiant loop in the thinnest space between the panels and tile. 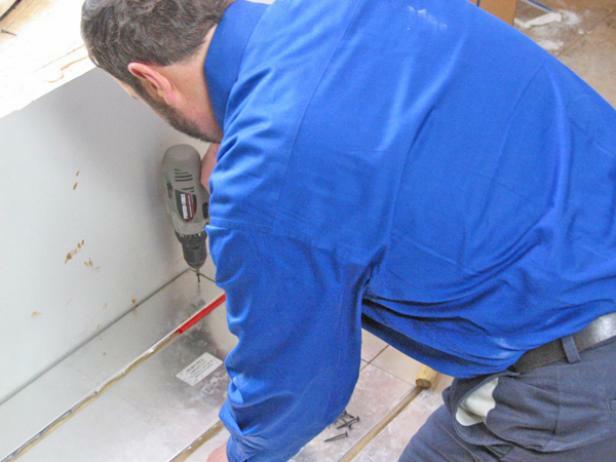 Leave the feed and return panels for the PEX loose. Drill two holes through the wall to get to the water heater. Mark them down, and keep the hole in line with the track. Remove the panel so the drill won't cause any damage. Permanently mount the last two panels. Remove the short pieces of PEX installed earlier. 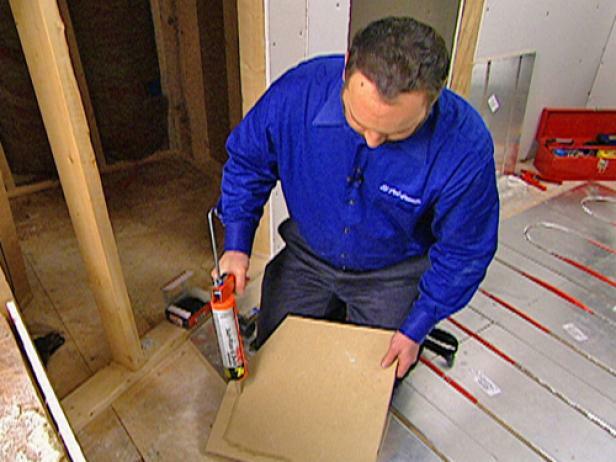 Tip: Always unroll the PEX pipe as you go to prevent kinks. Mark the end of the pipe in the direction the water will flow, and feed that end through the wall. Be sure to push plenty of extra pipe through the wall. 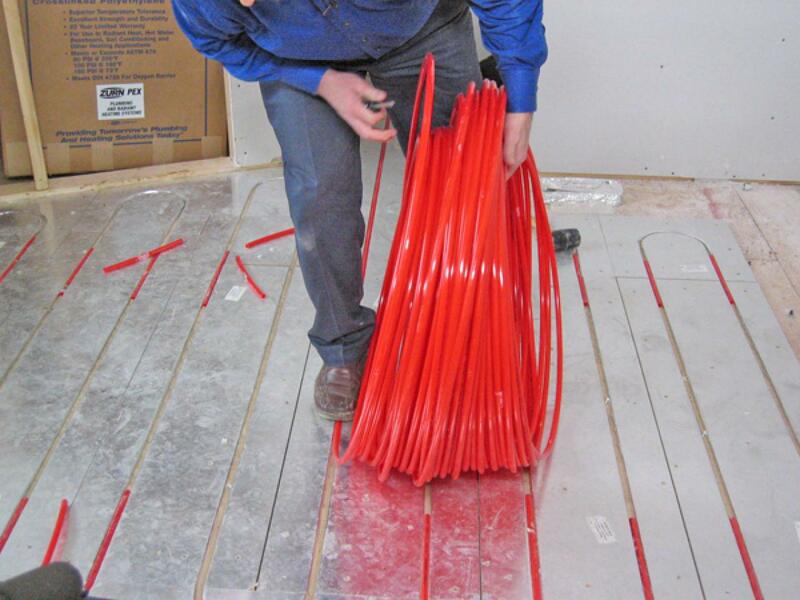 Unroll the PEX, and walk it into the track as you go. 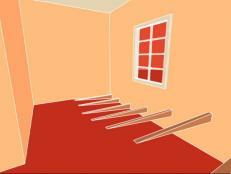 Take the turns and bends slowly to prevent damage to the pipe. Slowly continue the process until all of the tracks are filled. Leaving extra pipe, cut the PEX so you can feed it back through the wall. 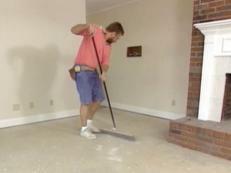 Use a mallet to ensure the PEX hasn't popped out of the track. 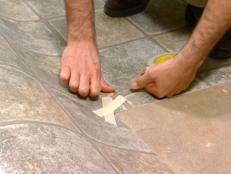 Tip: Run air or water through the system to check for leaks before installing the finished floor. 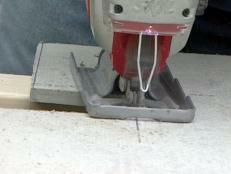 The radiant mixing block ties into the water heater. 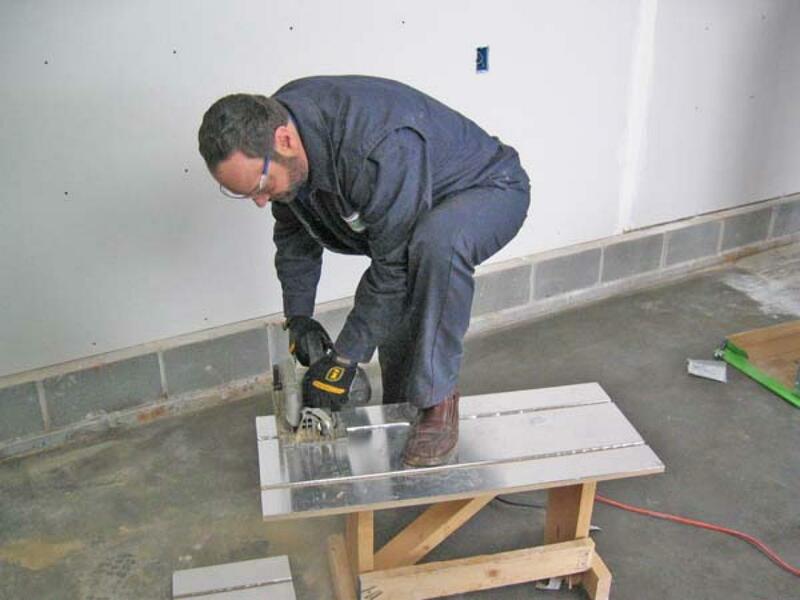 The feed and return from the radiant block will go into two ports and is connected to the supply, which comes from the water heater. Remove the control panel and the cover. 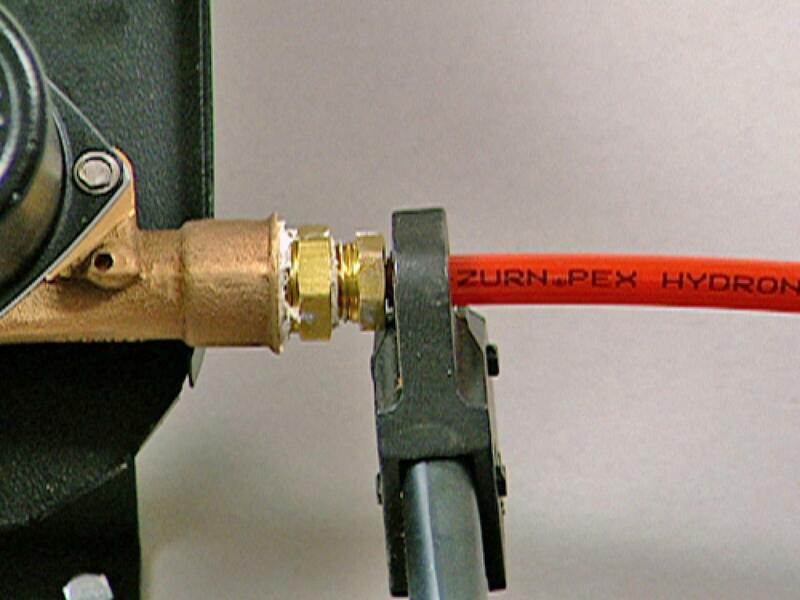 Use a threaded male adaptor coated with Teflon paste, and screw into the radiant heat loop port on the pump. Add Teflon paste to the threaded 3/8-inch PEX adaptor, and connect to the threaded male adaptor. 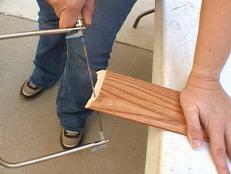 Use a pair of slip joint pliers to tighten down the connection. Repeat the process on the other radiant loop port. Mark and mount the valve using 1/4" x 2" hex screws. Check the PEX line for the marks made earlier indicating the flow direction. Cut the pipe to length. 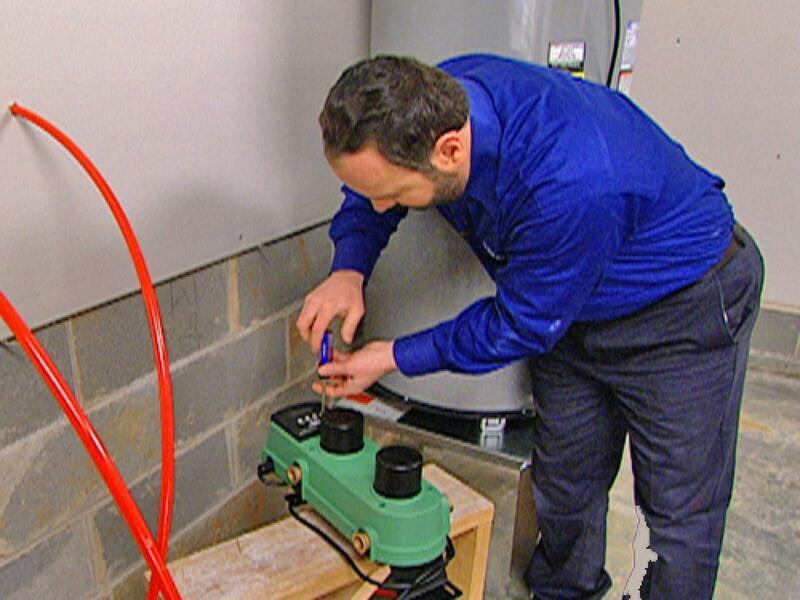 Place a crimp ring in place, and attach the PEX line to the appropriate port on the valve. 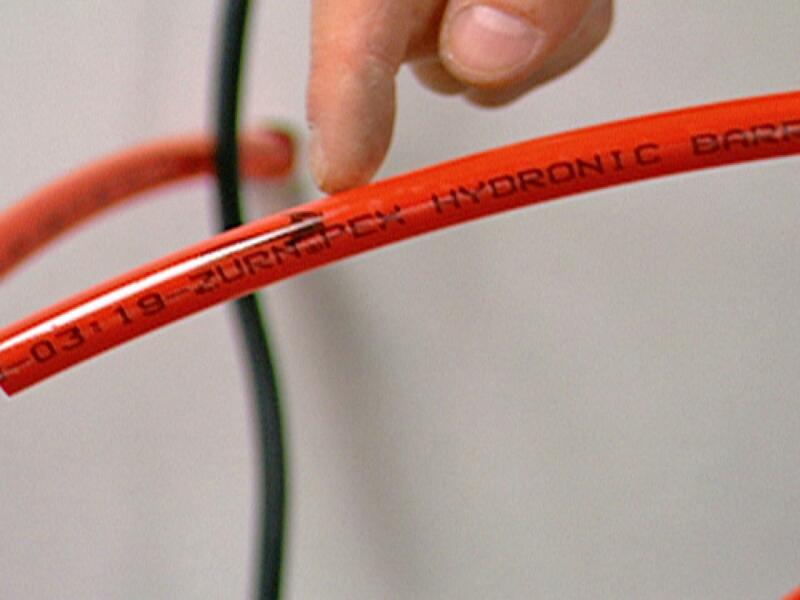 Use a crimping tool to secure the connection in place. 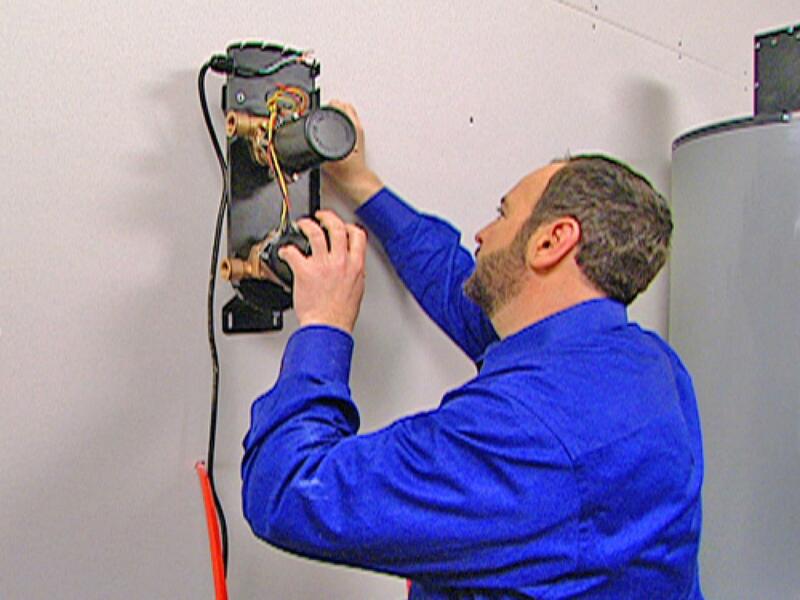 Connect the other side of the radiant loop, and run the thermostat line into the valve and replace the cover. Hook up the control panel by finishing up the wiring. Note: Always check with the manufacturer's instructions before wiring for specific instructions. Mount the radiant block, and connect the radiant loop to the block. Connect the controller to the water heater thermostat. 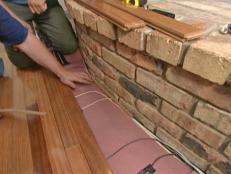 A radiant-heat floor can save homeowners up to 25 percent in energy bills. 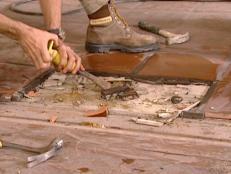 These step-by-step instructions show how to install a radiant-heat system and tile floor.